FA: Paul Turecki and Nancy Pfeiffer, 10/30/88. Climb the right-facing corner out the roof and continue up the crack until it ends. Make some committing moves to reach a bolt without a hanger. Sling the bolt with a stopper. Continue up face to bolt anchor. Rack: 2 ea 3.5”, 1 ea 4”, nuts, 1 rope. 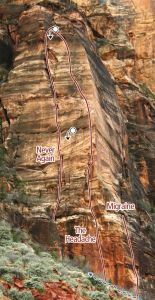 Which SuperTopo guidebooks include a topo for Migraine?